Governor Lalong (left) with Pinnick holding their awards after the ceremony in Johannesburg on Saturday night. President of the Nigeria Football Federation, Mr Amaju Melvin Pinnick, has dedicated the award presented to him at the African Football Alliance Award ceremony in Johannesburg on Saturday night to the NFF Executive Committee, Members of the NFF Congress and the Federation’s sponsors and partners. Speaking in Asaba on Monday morning, Pinnick stated in unambiguous terms that the road would have been much, much rougher without the full support, courage and vision of the NFF Board, the emboldening encouragement and unity of the Members of Congress and the heartwarming and helpful financial support of sponsors and partners. “I stand here today as President of the NFF and 1st Vice President of CAF thanks to the vision and full support of my colleagues on the NFF Board, the oneness and impregnability of the NFF Congress and the financial lifeline provided by our sponsors. The Government of Nigeria does so much to support our programs and our sponsors also put in a lot,” Pinnick said as he received the African Football Leadership Award, few hours after the Super Eagles made sure of a place at next year’s AFCON finals. Pinnick is also the President of the Organizing Committee for the AFCON, which for the first time, will welcome 24 teams next year summer. 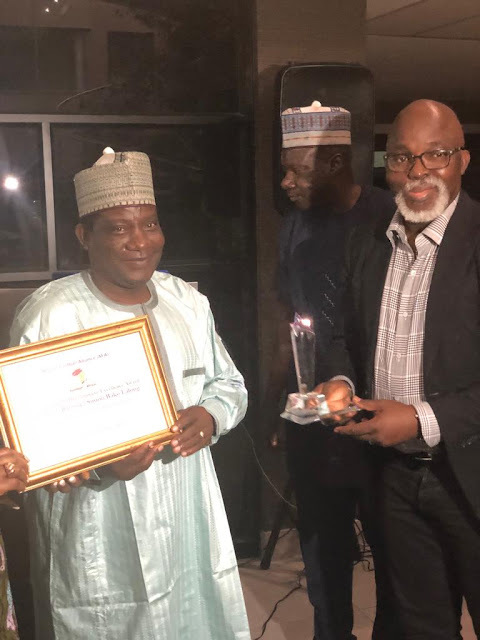 Also honoured on the night were Governor Simon Bako Lalong of Plateau State, who received the Africa Football Development Excellence Award, for his long-standing and continued support to football in Plateau State and Nigeria at large. The 1st Vice President of NFF, Barr. Seyi Akinwunmi, was handed the African Football Development Recognition Award for his well –known passion, commitment and investment in grassroots programs. AFA Convener, Gerrit Davids said the Awards program has the objective of encouraging more people to take leadership roles within football and to share knowledge on the best way to make African Football truly great.